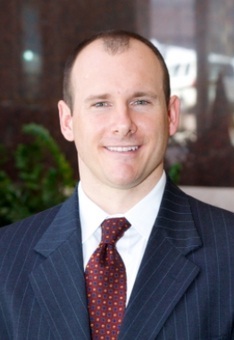 March 28, 2014 | David S. Maldow, Esq. 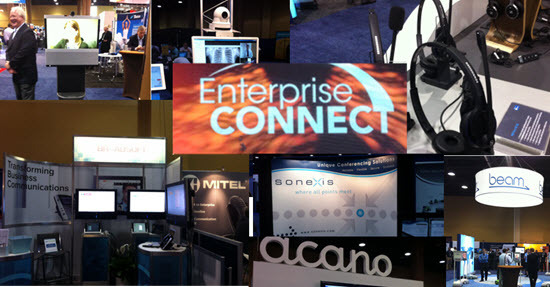 We hope you enjoyed Part 1 of our Enterprise Connect 2014 coverage. Let's continue the booth crawl with the next wave of vendors. We split up this segment of our coverage, so let's start with our publisher Howard Lichtman. 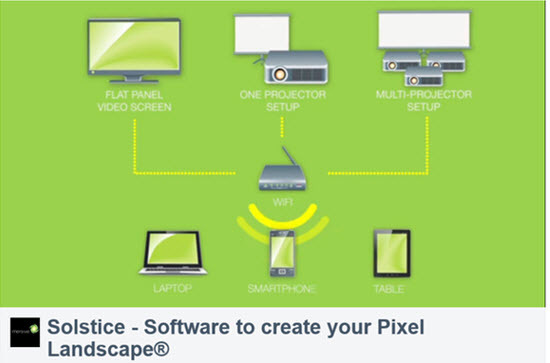 Similar to WOW Vision, Mersive's Solstice is another "Bring & Fling" / "Media Sharing" solution.� Unlike the Collab8 which wraps up hardware and software, the Solstice application is pure software and will run on any Windows PC connected to a display.� Participants download the Solstice client on their laptop (PC or Mac), tablet or smartphone (android or iOS), connect over wi-fi or Ethernet to the Solstice PC and can begin sharing content including HD video @ 60fps which looked spectacular in the demo at the Mersive booth.�The company recently announced an enhancement so that the Mersive experience can be managed from control panels made by AMX and Crestron. The MSRP on the Solstice software is $3500 per room and the company offers a "Small Group Edition" version that caps the number of participants able to share their screen at four for $1800. ScienceLogic makes tools to manage videoconferencing environments for video managed service providers and large enterprise video customers.� The company's software monitors video network infrastructure, end-points, and network connections.� Interestingly the company has continued to innovate in the space and is developing solutions to monitor virtualized video network infrastructure as well.� The company can now monitor individual nodes on Pexip instantiations. That concludes Howard Lichtman's coverage, the rest of this article was written by TPO News Managing Partner, David Maldow. We briefed with Chad Hart from Dialogic, who was one the panelists for "The WebRTC Innovators" EC Session. While many companies are "talking the talk", Dialogic has been fully invested in defining itself as a leader in WebRTC technology. With a background in supporting mass audio communications, Dialogic has evolved to support high quality rich media communications while protecting your network. They provide the technology behind the scenes, enabling partners such as these to offer a variety of UC, contact center, and other rich media applications. We look forward to covering future developments to the Dialogic platform, and the new applications they will be supporting. Compunetix and Sonexis form two pieces to a very interesting puzzle. Sonexis, (a wholly owned subsidiary of Compunetix) offers a successful audio conferencing platform. While Compunetix has its "Evergreen" offering of cloud based video MCUs. These service provider ready platforms can support large scale deployments, while offering users a high level of control through the cloud. Compunetix is also excited about their unique distribution partnership with AVer. I have been following this producer of high quality wireless microphones for many years. I evaluated Revolab microphones years ago and worked closely with their engineers, learning firsthand about the efforts they have taken behind the scenes to optimize their offerings for video enabled meeting rooms. As a result, it is not surprising that they are one of the first names you think of for high quality wireless VC audio. 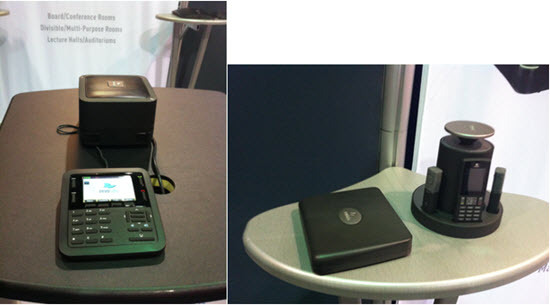 Revolabs was showing off the new FLX UC 500 and 1000 Conference Phones. As well as the their new Executive Elite microphones, with a completely refreshed design. Perhaps the biggest news is their acquisition by Yamaha, which appears to be beefing up its audio portfolio. 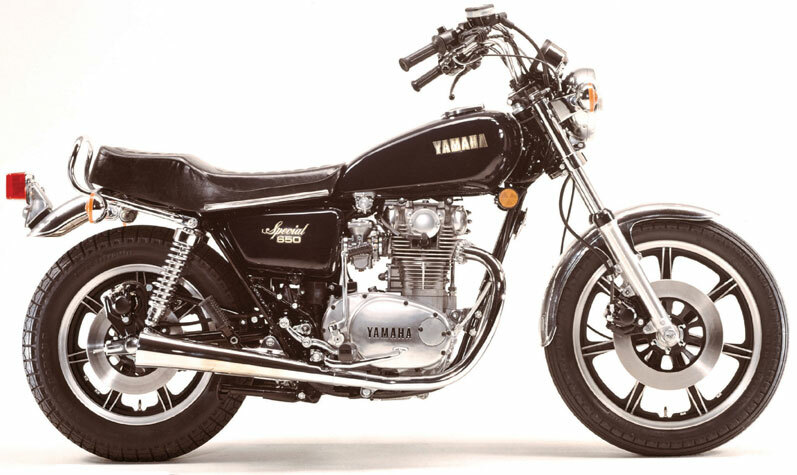 As a former Yamaha owner myself, I know they make quality products and expect they will take good care of the Revolabs line. 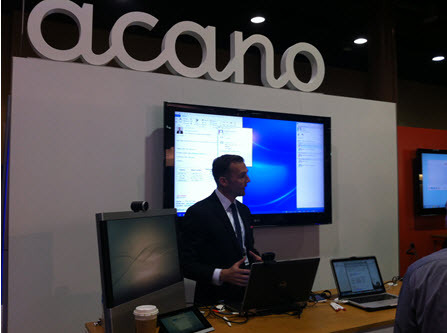 We caught a demo of Acano's Lync integration and we really like this implementation. Everyone is rushing to solve the Lync video problem in a variety of ways. 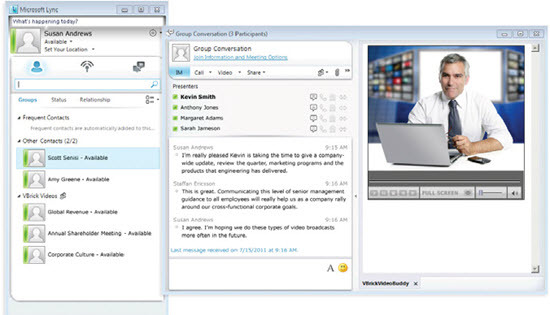 Ideally, users would be able to seamlessly replace the Lync video with a video solution of their choice, but Microsoft has locked down the Lync video button to ONLY open Lync video. Acano's approach to the probem is to treat Acano rooms as Lync contacts. You join an Acano space from Lync the same way you would start a meeting with any other Lync contact. One interesting side benefit is that you get Lync presence indications for your Acano meeting spaces. This provides a quick way to see which team space is being used at any given time and to keep track on your working teams from Lync. We will be trying this out soon for sure. AVI-SPL is the ultimate one stop shop in our industry. 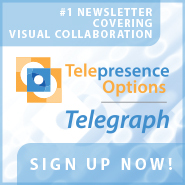 This organization provides so many of the services related to creating and managing a visual collaboration environment that it is simply impossible to cover them in a single booth visit. With that in mind, TPO has decided to attend AVI-SPL's Global Sales Meeting next week. We will be sure to talk to the team, and dive deep into their current strategy and future plans. We also have recently started a demo of AVI-SPL Virtual Meeting Room service and will be sure to share our results. While Beam's naysayers love to point out the various situations where this technology would not be effective, that doesn't change the fact that there are real existing use cases where it makes perfect sense. In many situations, mobility is a key element of a remote presence experience. 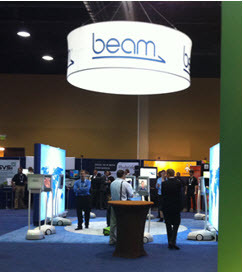 We are obviously long time fans, and even enjoy attending trade shows via Beam. LifeSize was represented by Video Evangelist Simon Dudley, who spoke on a very well attended panel, and was kind enough to brief me afterwards on everything from LifeSize's plans for InfoComm, to what things are really like behind the scenes at LifeSize, to how things used to be in the crazy early days of VC. I can't share any of it right now, but it is always sounds great coming from Simon. Part of it is his accent, and part of it is the real power of LifeSize's Smart Video philosophy. We look forward to catching up in June at InfoComm. I am clearly a UI bigot. It isn't just that I like shiny lights and flashy buttons (although there is nothing wrong with that). There is a direct, and pretty obvious, tie between usability and productivity. But a great UI can only take a product so far, there has to be some intelligence and muscle behind those good looks. So you can understand that I get excited about StarLeaf, which combines one of the sexiest UI's with a unique virtualized infrastructure, created by a legendary engineering team, with powerful interop and device support. Their new scheduling capability was just as easy to use as their endpoints, and their WebRTC demo was up and running. Their Breeze client is yet another solution we can't wait to try out and share our results. 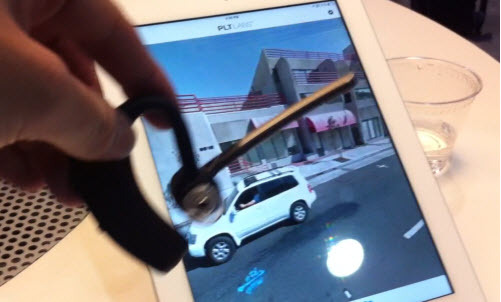 The UC provider was showing off a unique answer to the BYOD security issue with its "Dual Personal for UC solution. One device can be switched between a business, and personal, mode. Allowing for higher levels of security protecting work related communications and data. 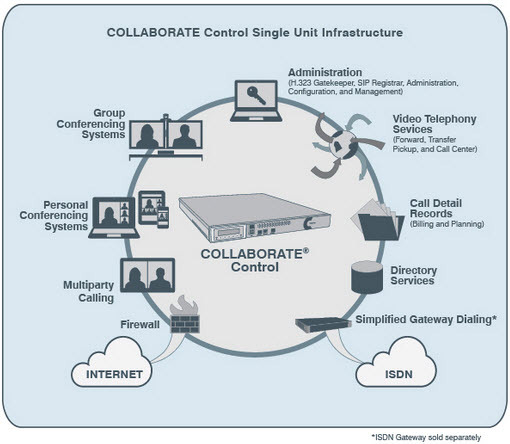 BroadSoft has entered a 5 year agreement for BT to distribute their Hosted IP UC services. It's great to see options and innovation in the UC space. Speaking of innovative UC offerings. We were very pleased with GenBand's offering in the space. Both users, and meeting moderators, are offered a higher level of control than expected from the typical solution. Whether it's the advanced abilities for users to control their layout and view, or the ability of moderators to individually block sidebar IM sessions, or its ability to embed in common apps like Salesforce, we found a lot to like in GenBand's demonstration. We hope to take a deeper dive sometime soon. A video meeting's effectiveness is directly limited by the quality of the audio. With that in mind, we weren't surprised to see several audio peripheral manufacturers in attendance. 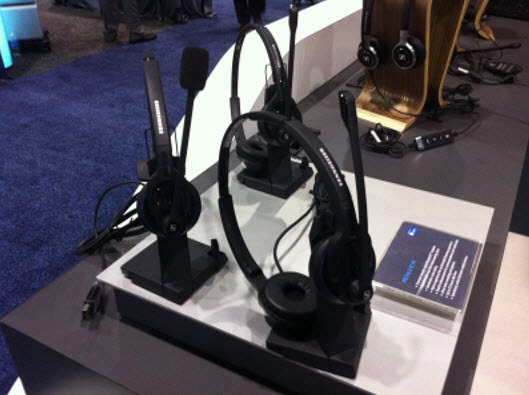 While we haven't had a chance to learn a lot about Sennheiser yet, we were struck by their nice design and solid specs. We gave the VDO360 a "Best In Show" award at last InfoComm and were happy to see them here on display at Enterprise Connect. As software gets more usable and flexible, the DIY model becomes more and more attractive. VDO360 is at the top of the curve in affordable PTZ USB cameras and enjoying a very positive buzz. The master of consumer peripherals has been baby stepping its way into the meeting room. They pretty much own desktop videoconferencing, and have been offering webcams with wider fields of view, and unique designs to go beyond the desktop, to the small huddle room space. But even a high end webcam can't really capture a good sized meeting room. For that, you need a "real" meeting room endpoint, which Logitech hasn't attempted to provide until now. The new Logitech ConferenceCam CC3000e, takes your laptop, running your favorite VC software, and turns it into a viable meeting room solution. This could be a game-changer. During the course of the event, this product was constantly brought up in discussions with analysts, attendees and even other vendors. The solution makes sense. We have laptops readily available to act as the "brains" for VC systems. 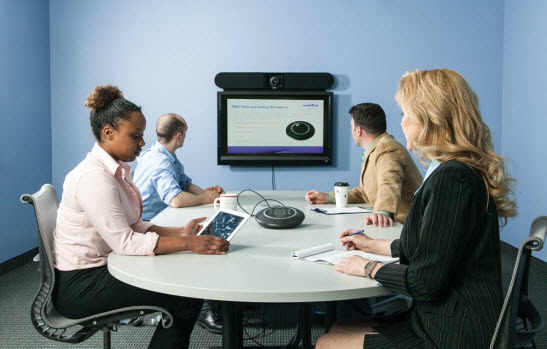 Why not save money by purchasing affordable, "brainless" VC systems for our meeting rooms? The fact that it is made by Logitech answers the "Yeah, but is it good?" question. The crowd at their booth was clearly impressed. I use a Plantronics Voyager Bluetooth headset, and have been very pleased by its ease of use and high quality audio. There is no better accessory for my iPhone when I am on the go. While I was ready to see the latest version, I was not prepared for how much new technology they have stuffed into that little earbud. In particular, motion detection technology allows for a number of amazing potential uses. In the image above, I am holding an earbud synced to an iPad. When I turned the earbud, the view on the iPad changes. If I was wearing the earbud and moving around naturally, it would be an Occulus like VR experience. The cool factor is off the charts, but it really does have some very powerful real life potential applications. Plantronics had a number of updated and new devices on display and I hope to take a closer look at the next event. I was extremely pleased to see ProtonMedia at EC. Perhaps one of the most unique, and interesting, collaboration technologies I have ever covered. We all get the concept of having an Avatar, thanks to James Cameron. But what do we think about meeting for business via virtual avatars? As a videogamer, I've always been ready. For many applications it makes a lot more sense, and would be a lot more effective, than other means of remote meeting. Once people get past the novelty, and stop "playing" in the virtual world with their new avatars, they can realize some serious productivity benefits. The only question is whether non-games can see this tool for what it is, put aside their fears, and jump into the matrix to see what it is like for themselves. We recently covered Sonus here. Since then they have released a more powerful version of their hardware SBC, and a new virtualized version for more flexibility. It was great to stop by the booth and catch up with the team. While their technology may be a step removed from the user experiences and applications we love to focus on, its importance should not be dismissed. Without the right infrastructure to support it in the background, your apps won't work, or even worse, they may hurt your network and compromise security. You know that feeling you get when one of the big guys at the pool starts climbing the diving board? You know when he goes in, there is going to be a big splash. Unify (formerly Siemens) now has an ideal name for a unified communications company, and they were everywhere at EC. They are gearing up their next-gen UC platform "Project Ansible" and they clearly committed to this new vision. It is hard to put a finger on it, but after speaking to their CEO, Dean Douglas and various members of the team I felt that they have a very cohesive ("unified" if you will), strategy and set of goals for the future of UC. This is company with resources, experience, and an intense focus on UC. Everyone will be watching their next moves. We recently covered the Vaddio GroupStation and thought the concept made a lot of sense. We are not surprised to see some industry heavyweights now releasing similar models. For Vaddio, this show was about their new EasyUSB Audio Bridge and BaseStation. The EasyUSB allows users to combine their pro analog audio equipment, with their USB based apps. The BaseStation is the latest entry in the meeting room "swipe and share" arena. Users work off their personal PCs and tablets, while the BaseStation allows for easy connection and sharing on a meeting room monitor. 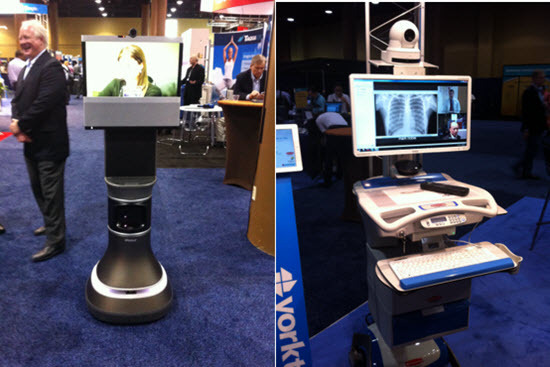 Yorktel had one of the coolest booths in the show, with iRobots, as well as video kiosks, healthcare video carts (in partnership with Rubbermaid and Vidyo), and more. Yorktel has a long history in providing UCC and video managed services. Yorktel recognizes the current trend to use these technologies for a lot more than the typical video meeting, and they are trying to lead the way with examples of actual applications in practice. iRobot was also shown at the Cisco booth, their partner for the video hardware in the Ava 500 robot. The Ava is the Ferrari of robots, with what I consider to be one of the ultimate premium features; autopilot. While mobility is great to "look around" with your robot, or tour around the plant floor, it is really nice to be able to simply let it drive itself back to its docking station. It is equally convenient to be able to program it to drive itself to the meeting, before you even log in. We hope you enjoyed our Enterprise Connect coverage as much as we enjoyed bringing it to you. Stay tuned as we gear up for the next big event. InfoComm in Vegas! Howard Lichtman is the Founder and President of the Human Productivity Lab, a consulting firm that helps organizations design visual collaboration strategies, build Video Network Operation Centers (VNOCs), and helps with RFP creation, bid management, and oversight. 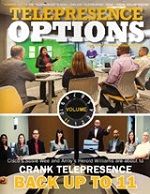 He is the publisher of Telepresence Options, the leading publication covering visual collaboration where he and his team share the lessons learned from real world deployments and cover the industry's latest advancements. Similar to WOW Vision, Mersive's Solstice is another \"Bring & Fling\" / \"Media Sharing\" solution.� Unlike the Collab8 which wraps up hardware and software, the Solstice application is pure software and will run on any Windows PC connected to a display.� Participants download the Solstice client on their laptop (PC or Mac), tablet or smartphone (android or iOS), connect over wi-fi or Ethernet to the Solstice PC and can begin sharing content including HD video @ 60fps which looked spectacular in the demo at the Mersive booth.�The company recently announced an enhancement so that the Mersive experience can be managed from control panels made by AMX and Crestron. The MSRP on the Solstice software is \$3500 per room and the company offers a \"Small Group Edition\" version that caps the number of participants able to share their screen at four for \$1800. 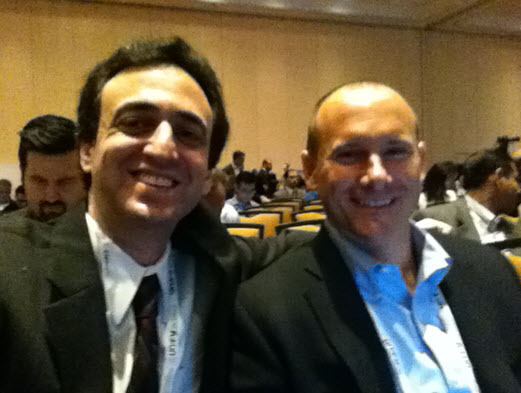 We briefed with Chad Hart from Dialogic, who was one the panelists for \"The WebRTC Innovators\" EC Session. While many companies are \"talking the talk\", Dialogic has been fully invested in defining itself as a leader in WebRTC technology. With a background in supporting mass audio communications, Dialogic has evolved to support high quality rich media communications while protecting your network. They provide the technology behind the scenes, enabling partners such as these to offer a variety of UC, contact center, and other rich media applications. We look forward to covering future developments to the Dialogic platform, and the new applications they will be supporting. Compunetix and Sonexis form two pieces to a very interesting puzzle. 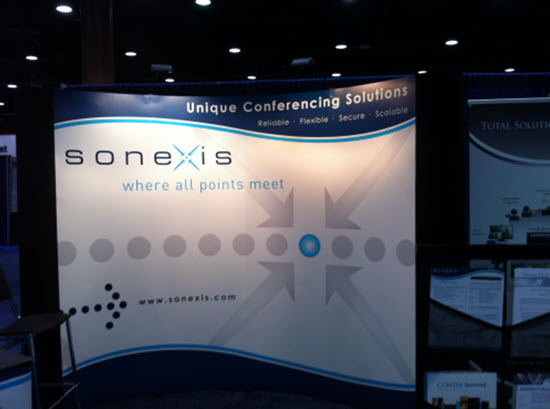 Sonexis, (a wholly owned subsidiary of Compunetix) offers a successful audio conferencing platform. While Compunetix has its \"Evergreen\" offering of cloud based video MCUs. These service provider ready platforms can support large scale deployments, while offering users a high level of control through the cloud. Compunetix is also excited about their unique distribution partnership with AVer. The UC provider was showing off a unique answer to the BYOD security issue with its \"Dual Personal for UC solution. One device can be switched between a business, and personal, mode. Allowing for higher levels of security protecting work related communications and data. 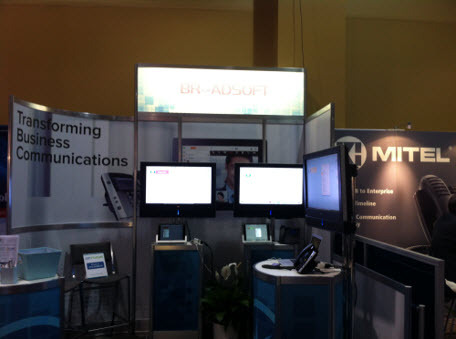 BroadSoft has entered a 5 year agreement for BT to distribute their Hosted IP UC services. It's great to see options and innovation in the UC space. We gave the VDO360 a \"Best In Show\" award at last InfoComm and were happy to see them here on display at Enterprise Connect. As software gets more usable and flexible, the DIY model becomes more and more attractive. VDO360 is at the top of the curve in affordable PTZ USB cameras and enjoying a very positive buzz. The master of consumer peripherals has been baby stepping its way into the meeting room. They pretty much own desktop videoconferencing, and have been offering webcams with wider fields of view, and unique designs to go beyond the desktop, to the small huddle room space. But even a high end webcam can't really capture a good sized meeting room. For that, you need a \"real\" meeting room endpoint, which Logitech hasn't attempted to provide until now. The new Logitech ConferenceCam CC3000e, takes your laptop, running your favorite VC software, and turns it into a viable meeting room solution. This could be a game-changer. During the course of the event, this product was constantly brought up in discussions with analysts, attendees and even other vendors. The solution makes sense. We have laptops readily available to act as the \"brains\" for VC systems. 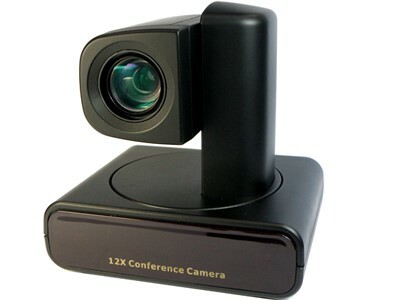 Why not save money by purchasing affordable, \"brainless\" VC systems for our meeting rooms? The fact that it is made by Logitech answers the \"Yeah, but is it good?\" question. The crowd at their booth was clearly impressed. I was extremely pleased to see ProtonMedia at EC. Perhaps one of the most unique, and interesting, collaboration technologies I have ever covered. We all get the concept of having an Avatar, thanks to James Cameron. But what do we think about meeting for business via virtual avatars? As a videogamer, I've always been ready. For many applications it makes a lot more sense, and would be a lot more effective, than other means of remote meeting. Once people get past the novelty, and stop \"playing\" in the virtual world with their new avatars, they can realize some serious productivity benefits. The only question is whether non-games can see this tool for what it is, put aside their fears, and jump into the matrix to see what it is like for themselves. You know that feeling you get when one of the big guys at the pool starts climbing the diving board? You know when he goes in, there is going to be a big splash. Unify (formerly Siemens) now has an ideal name for a unified communications company, and they were everywhere at EC. They are gearing up their next-gen UC platform \"Project Ansible\" and they clearly committed to this new vision. It is hard to put a finger on it, but after speaking to their CEO, Dean Douglas and various members of the team I felt that they have a very cohesive (\"unified\" if you will), strategy and set of goals for the future of UC. This is company with resources, experience, and an intense focus on UC. Everyone will be watching their next moves. We recently covered the Vaddio GroupStation and thought the concept made a lot of sense. We are not surprised to see some industry heavyweights now releasing similar models. For Vaddio, this show was about their new EasyUSB Audio Bridge and BaseStation. The EasyUSB allows users to combine their pro analog audio equipment, with their USB based apps. 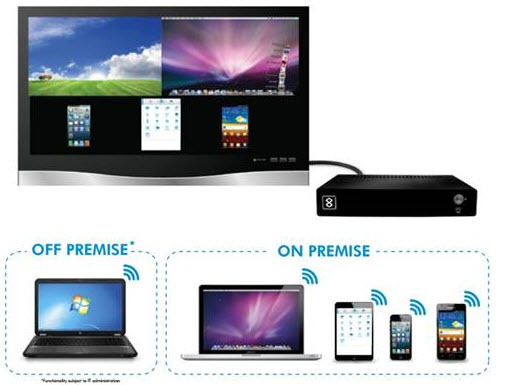 The BaseStation is the latest entry in the meeting room \"swipe and share\" arena. Users work off their personal PCs and tablets, while the BaseStation allows for easy connection and sharing on a meeting room monitor. iRobot was also shown at the Cisco booth, their partner for the video hardware in the Ava 500 robot. The Ava is the Ferrari of robots, with what I consider to be one of the ultimate premium features; autopilot. While mobility is great to \"look around\" with your robot, or tour around the plant floor, it is really nice to be able to simply let it drive itself back to its docking station. It is equally convenient to be able to program it to drive itself to the meeting, before you even log in.